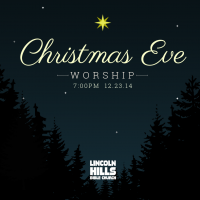 Lincoln Hills begins a new tradition this year with a Christmas Eve Worship Service taking place on the evening before Christmas Eve. Join us for a intimate evening of traditional hymns and carols. There will be no Childcare available for this service.